Chivas Brothers, the Scotch whisky and premium gin business of Pernod Ricard, is launching Chivas Regal Extra, a new super premium expression blended with rare malt aged in sherry cask, in key Asian airports. 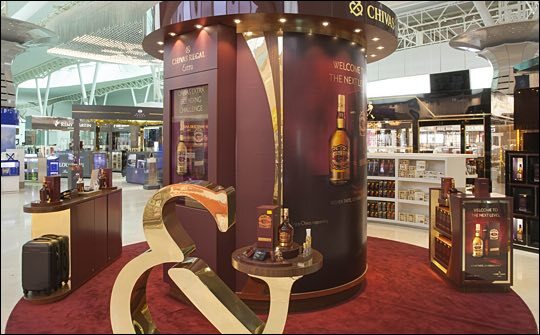 The launch into travel retail across Asia is supported by a new campaign, ‘Welcome to the Next Level’, that introduces the newest member in the Chivas Regal family and engages consumers with a luxury airside experience. Travellers will be educated and inspired by in-store comparison tasting bars that will bring to life the key differences between Chivas Regal 12 and Chivas Regal Extra and highlight the influence of the sherry cask. Selected airports will also feature an interactive game, challenging travellers to learn more about the product and entitling them to a premium gift. In addition, they will have a chance to discover more about Chivas Regal Extra via a sherry cask display and aroma kits. Seven airports across Asia will be supported by the campaign. These include Singapore Changi airport, Malaysia Kuala Lumpur International airport, Hong Kong International airport, Thailand Suvarnabhumi airport and Vietnam Tan Son Nhat International airport in May and June; at Korea Incheon International airport in June and at Japan Haneda Tokyo International airport in July. “We are delighted to be introducing the newest member in the Chivas Regal family - Chivas Regal Extra, to travel retail across Asia and to be supporting the launch with the ‘Welcome to the Next Level’ campaign. Our goal is to engage with travellers and offer them a unique shopping experience and premium gifts through a set of dynamic in-store activities at the airport,“ says Kyung Min, marketing manager at Pernod Ricard Asia Travel Retail.